Our entire staff continually strives to exceed guest expectations, by providing the best value in Wichita. 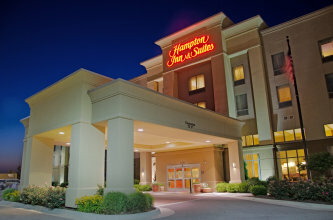 At the Hampton Inn & Suites Northeast, our entire staff continually strives to exceed guest expectations, by providing the best value in Wichita. Our 100% smoke free property, located off K-96 near the intersection of Greenwich & 21st Street in Regency Lakes, is specifically designed to cater to the needs of today's traveler. We are pleased to offer our clients the conveniences of both home and office - while on the road. Various shopping and dinning options are nearby for the corporate traveler, family vacation or weekend getaway. Our guests truly enjoy the Hampton Bed Experience. You'll be on cloud nine with our comfy mattress and soft sheets, your choice of feather or foam pillows, and a plush down-like blanket and duvet. Complimentary High-Speed Internet access is available both wired and wireless. Hair dryer, iron / ironing board, curved shower rods and adjustable WaterPik pulsating showerheads complete the standard room. Upgrade to our one of our 32 suites to include a sofa bed, microwave and refrigerator. Start the day right with our complimentary On The House Hot Breakfast. Or, if you are in a hurry on the weekdays, grab one of our complimentary On The Run Breakfast Bags for a healthy breakfast to go. The Suite Shop conveniently located near the front desk carries a variety of microwaveable foods, beverages and sundries. Other hotel amenities include an indoor pool, exercise facility, meeting room, complimentary business center and on-site laundry facilities. The foundation of the value we offer to our guests is the 100% Hampton Guarantee. This guarantee assures that every guest of our hotel receives friendly service, clean rooms and comfortable surroundings, every time. That's our commitment and your guarantee. That's 100% Hampton. We Love Having You Here.